Even with impact of the triennial ConExpo/ConAg exposition that followed the NDA’s 41st Annual Convention at The Mirage, the Association’s 2014 convention proved a great success. Recent survey results reveal that show attendees enjoyed every element of the convention from former Energy Secretary Steven Chu’s keynote address, to FMI’s Leadership Development Institute, as well as, the Monday Night Jimmy Buffet Theme Party to this year’s gold tournament at the Arroyo Golf Club. Similarly, exhibitors at this year’s show noticed a significant increase in purchases made from the exhibition hall floor and interest in the many new products introduced at the 2014 Convention. This all bodes well for the growing construction economy and the NDA’s 42nd Annual Convention at the Gaylord Opryland in Nashville in March of 2015. 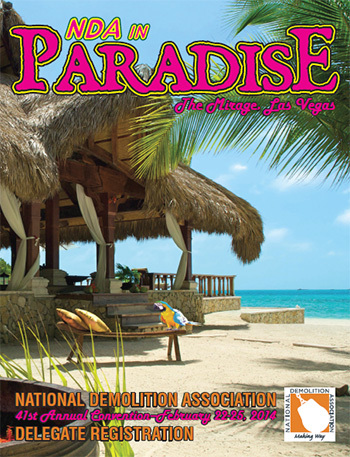 The Southern California Chapter of the National Demolition Association will be celebrating their 25th Silver Anniversary out at the Pacific Palms Resort in City of Industry, Calif., on June 3-4. This important event will feature a cocktail reception and dinner on Tuesday evening, celebrating the Chapter’s 25 years of commitment and service to the mission of the NDA and its members in the state of California, followed by a Silver Anniversary Best Ball Golf outing. Always well attended, the Southern California Chapter wants to invite the entire demolition industry to their Silver Anniversary celebration. See the attached flier for additional attendance and sponsorship information. Funds raised at this event support the Southern California Chapter’s $7,500 college scholarship presented every year at the NDA’s Annual Banquet. It's tax time. There, we said it. Now the good news; buying your tax preparation software through AchieveLinks earns you Links® Reward Points that you can redeem from thousands of options such as merchandise, travel, once-in-a-lifetime experiences, gift cards and more. A handful of studies on public-private partnerships in highway construction suggest that such arrangements "have built highways slightly less expensively and slightly more quickly, compared with the traditional public-sector approach," a Congressional Budget Office researcher told a special House Transportation & Infrastructure Committee panel. A radiation-proof superhero could make sense of Japan’s Fukushima Daiichi nuclear power plant in an afternoon. Our champion would pick through the rubble to reactor 1, slosh through the pooled water inside the building, lift the massive steel dome of the protective containment vessel, and peek into the pressure vessel that holds the nuclear fuel. Unfortunately, mere mortals can’t get anywhere near that pressure vessel, and Japan’s top nuclear experts thus have only the vaguest idea of where the melted fuel ended up in reactor 1. The Construction & Demolition Recycling Association, Aurora, Ill., has announced the organization’s 2014 industry award honorees. CDRA is a national trade organization that promotes the safe recycling of the more than 350 million tons of recoverable construction and demolition materials generated annually in the United States. The 2014 awards were presented at the C&D World, the annual meeting of the CDRA, March 5 in Las Vegas. Transportation Secretary Anthony Foxx recently said he expects a tough fight in Congress this year over funding for infrastructure. Foxx and President Barack Obama are pushing Congress to enact a four-year $302 billion road and transit appropriations bill before current funding runs out in August or September. The construction, utility and housing sectors will be required to implement best management practices to prevent erosion at construction sites in lieu of numeric nutrient limits for turbidity in stormwater under a final Environmental Protection Agency rule published March 6. Crews recently began demolishing the charred remnants of what was to be 172 new apartments in San Francisco's fast-growing Mission Bay neighborhood. The mechanical crunching was the first step in a rebuilding process that could take two years. Massachusetts Attorney General Martha Coakley has announced that the owner of a former paper mill site in Lawrence, Mass., has been prohibited by a court order from conducting what she terms illegal demolition and metal salvaging that releases asbestos at the property. Once you have a stack of applications for a job opening, it's best to develop a list of preliminary, prescreening questions to ask promising applicants at the earliest possible stage in your hiring process. People who need a job will tell you they'll work any days, hours or times you want. However, if you hire them and the hours aren't to their liking, they'll soon be showing up late or not at all. Head this aggravation off at the pass by asking these questions before the applicant knows what days/hours/shifts you need to fill. Crews recently began demolishing the charred remnants of what was to be 172 new apartments in San Francisco's fast-growing Mission Bay neighborhood. Americans who own their own businesses have to wear a lot of hats, from saleswoman to marketer to janitor. And at this time of year, one other role the self-employed need to fill is that of accountant and tax preparer. The good news is that a host of credits and deductions the Internal Revenue Service offers help sole proprietors of small businesses make the most of their endeavors. But the bad news is that the tax code can often be intimidating — especially to first-time filers who are self-employed. To help take the headache out of your 2013 tax return, here are five money-saving tax tips for those who own their own business and are about to file.